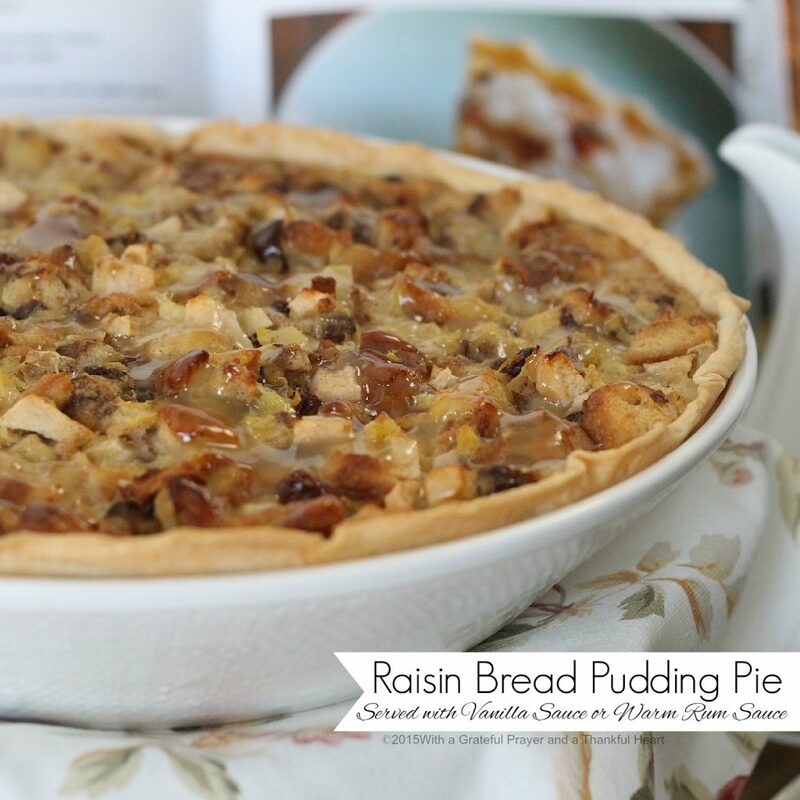 This lovely Raisin Bread Pudding Pie is just one of several recipes I have made from a new cookbook with Scandinavian roots. 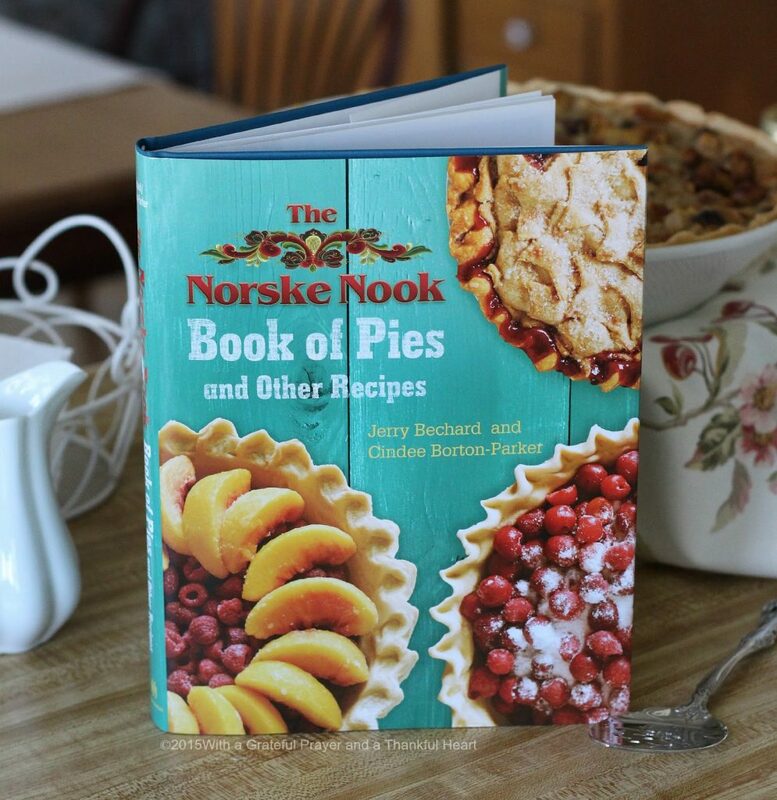 The Norsk Nook Book of Pies and Other Recipes, by Jerry Bechard and Cindee Borton-Parker, published by the university of Wisconsin press, has an official publication date of April 27, 2015. I was thrilled to receive a copy to review and even happier when the book arrived and I was able to look through the amazing collection of more than 70 award-winning recipes. Page after page of beautiful photos with recipes to make just about every type of pie you can imagine! 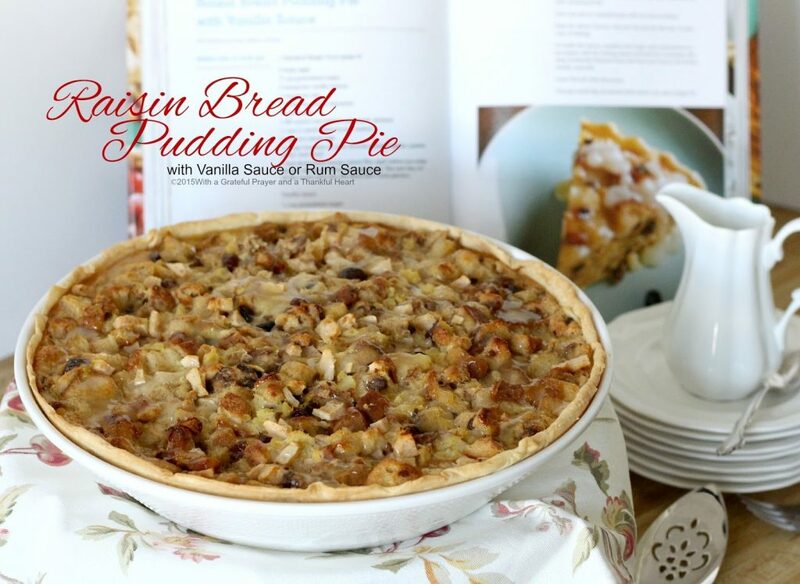 There are recipes for pie crusts, various toppings and pudding’s for pies, pies with Dutch and praline toppings, fruit pies with double crusts, an interesting section of pies using popular candy bars, berry pies, cream cheese pies, sour cream pies, meringue pie’s, single crust pies, frozen pies, sugar-free pies, cheesecakes, tortes, muffins and other Scandinavian specialties. Yes, there are a lot of pies in this collection to inspire and tantalize your sweet tooth! 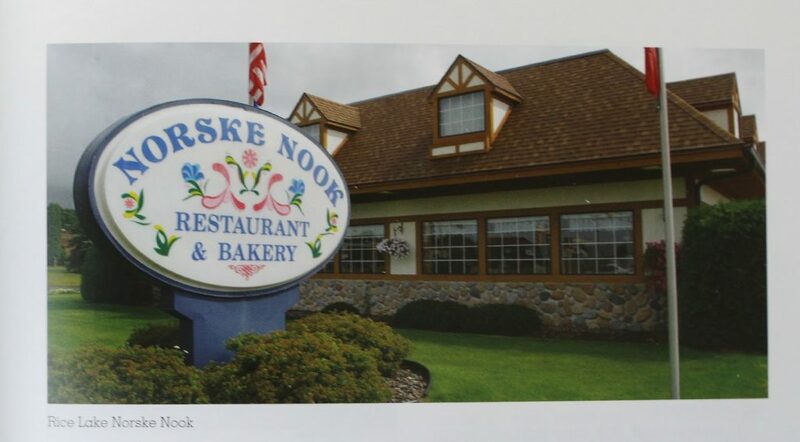 Founded as a small town Café in 1973, the Norsk Nook is now a famous restaurant with four locations and another one soon to open. 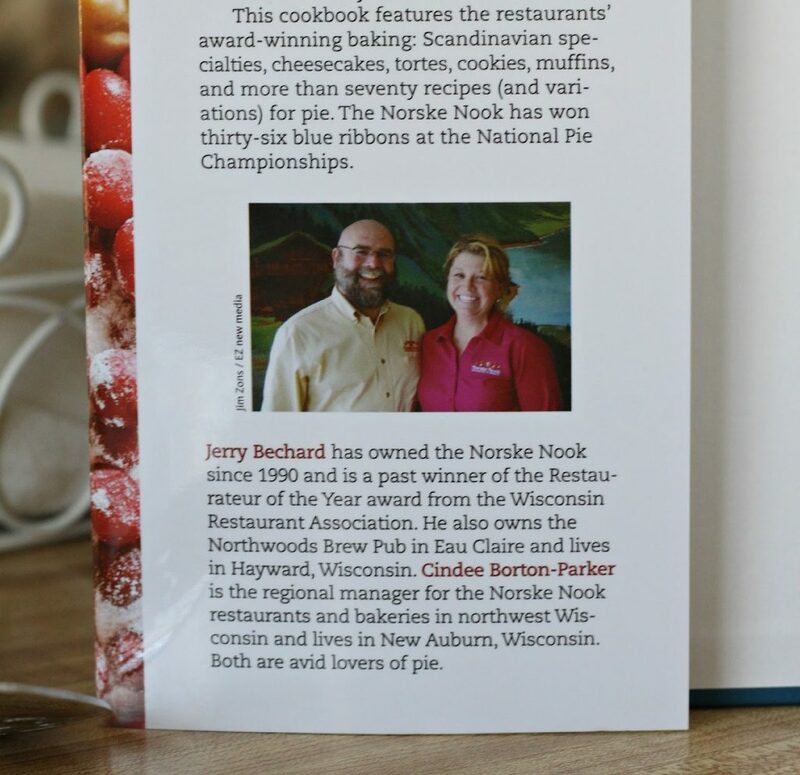 This cookbook features the restaurants award-winning baking recipes. 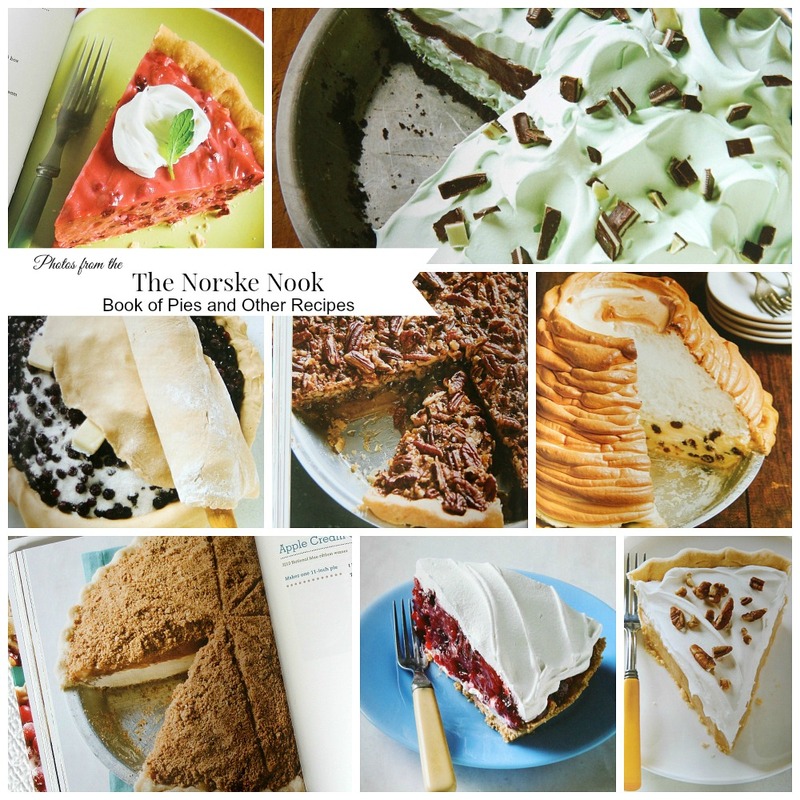 Seeing the amazing pies featured in this cookbook, it is not a surprise to me that The Norsk Nook has won 36 blue ribbons at the national pie championships. 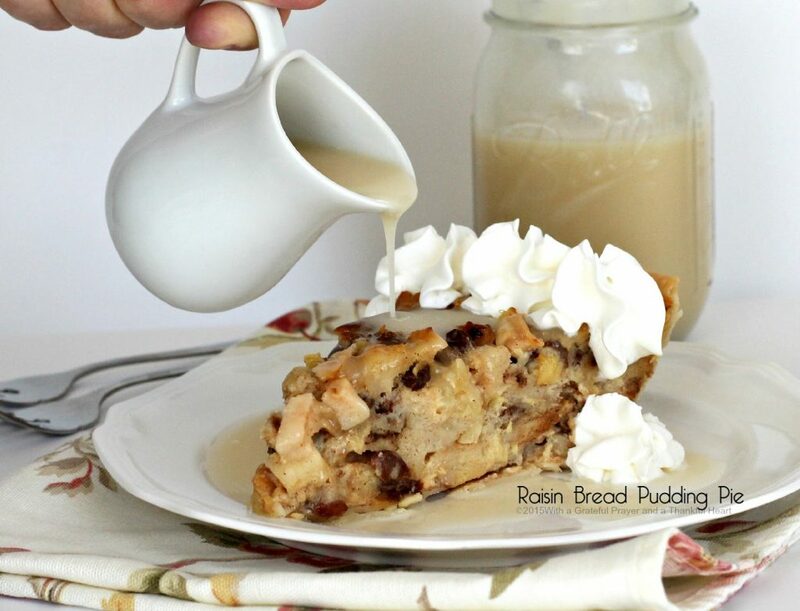 I can tell you, this slice of Raisin Bread Pudding Pie drizzled with Vanilla Sauce was delicious! I have made bread pudding before but never a pie version. It cut easily into beautiful slices and looked pretty on the plate. I made the pie twice already. The first time was a bit of a mess. The pie looked ugly. But it tasted heavenly! The problem was not with the recipe. Even though I used the largest pie plate I had, it was too small. The pies in this book are for 11-inch pies. I am familiar with the standard 8-inch, 9-inch or deep dish kitchen pie pans. Be sure your pan or dish is large enough to accommodate the quantity of the filling to avoid overflow. The second time I made this pie was for a dinner get-together with friends. This time I used a oven-safe pasta bowl and it was the perfect size. The pie looked great and our friends loved it and even asked for the recipe. The Vanilla Sauce is incredible as is the Warm Rum Sauce. Serve with a dollop of fresh whipped cream, if desired, and enjoy! In a large bowl, whisk together all the ingredients except the bread and the apples. Add the bread cubes and the apples and let soak for 2 to 3 minutes. Mound the mixture into the crust. 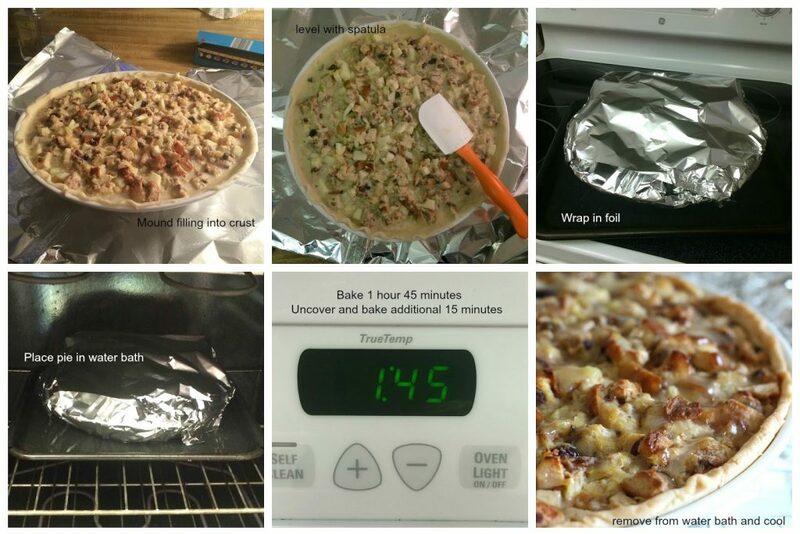 Put aluminum foil under the pie pan and also cover the top with aluminum foil. 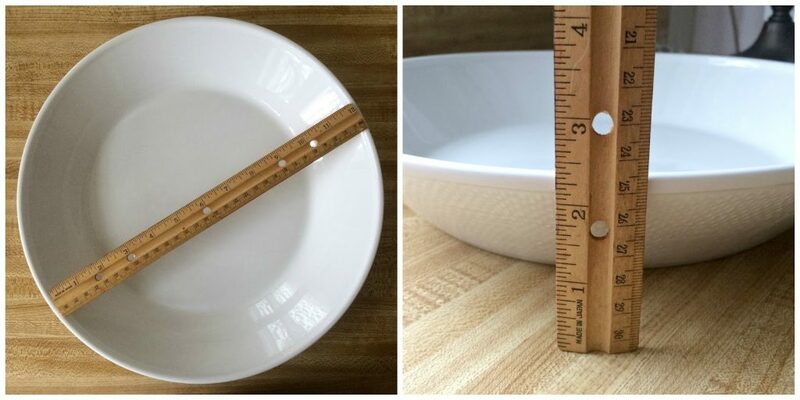 Place the pie in a shallow pan with an inch of water. Bake for about 2 hours. Uncover the pie for the last 15 minutes of baking. To make the sauce, combine the sugar and cornstarch in a saucepan. Add the boiling water and boil for 5 minutes, stirring constantly. Remove from the heat and mix in the butter, vanilla and salt. Cover the pie with the sauce. 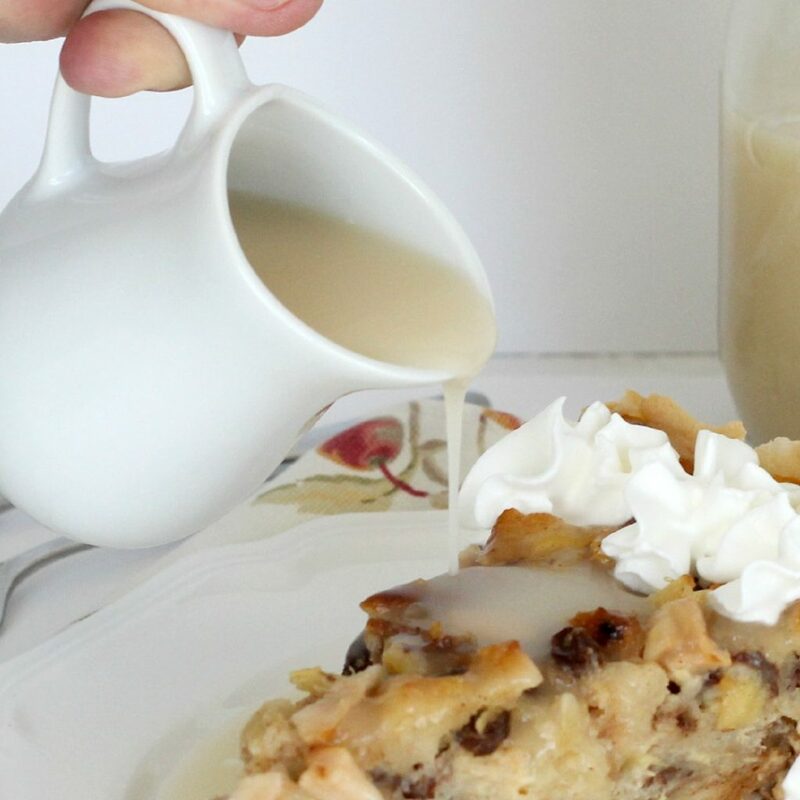 This pie could also be served with warm Rum Sauce. To make the rum sauce, combine the sugar, cornstarch, and salt in a saucepan and mix. Add water and boil for 6 to 8 minutes. Remove from heat and add the butter. Stir until butter is melted. Add the brandy and rum. Stir. I really like this cookbook because it is filled with the types of pies and desserts that would be well received by my family and friends. They are visually attractive with a homemade appeal. This is a great collection with many delicious recipes. None of the recipes I have read through seem complicated and some include common pantry ingredients like gelatin powder, cook-and-serve pudding mix and frozen whipped topping. I look forward baking my way through this cookbook! Here is a small sampling of some of the gorgeous pies you will find in the cookbook. Disclosure: I received this book from the publisher in exchange for my honest review. Everything looks yummy! I so miss the breads and pies since going GF. My daughter makes a pie once in a while for me…love them, but do not need them. 🙂 And I was such a bread fan. I have my GF bread, but it isn't the same. Just happy to have the memory of really GOOD stuff….and enjoy what I CAN have. Isn't that a fun book? I made the Butterscotch Pie and had the same problem with extra filling. In my case I put it into a couple of ramekins and had it for dessert on another day. I'm glad that you tried this recipe. It looks good and I plan on giving it a try, perhaps in an 11" pie plate if I can find one. Since I collect cookbooks this looks like one for me, ~smile~ The raisin bread pudding looks and sounds delicious! Your photos are always so lovely, thanks for sharing. Oh wow that looks good. I've had bread pudding before but not bread pudding pie. You make everything look beautiful and this pie is no exception! I love cookbooks ~ read them like a novel. 🙂 Thanks so much for sharing this one and the recipes! Oh my goodness…I want some of this right now!